A rash is the term to describe a change in the skin that affects its color, appearance or texture. Rashes may cause the skin to become red, itchy, bumpy, dry, cracked, blistered, or swollen, and may be painful. Rashes can affect localized areas of the body, or may spread throughout the body. The causes of rashes vary widely. Symptoms of many rashes are similar, often making them a challenge to diagnosis. Because the causes are numerous, they are also often difficult to treat. Treatment will focus on relieving symptoms after a sometimes-estimated diagnosis. Often rashes will disappear on their own in several days, or may be relieved with simple lotions and creams. Contact dermatitis refers to a variety of rashes that are brought on by skin contact with something that irritates the skin, or that causes an allergy. Rashes will generally appear within 48 of contact with the irritant. A common example of contact dermatitis is poison oak or poison ivy. These plants contain oil called "urushiol," which evokes a rash-causing allergic response in 65-70% of the population. Other common materials causing rashes include: soaps, detergents, perfumes, cosmetics, jewelry, certain fabrics, or latex. Usually rashes caused by allergy or irritants only affect the area of the skin exposed to the rash-causing material. Symptoms generally include: inflammation of the skin, redness, small bumps, and itching. Treatment may involve avoiding the allergen that caused the rash, as well as using topical steroids, such as over-the-counter 1% hydrocortisone. The most common bacterial infection is impetigo, which is caused by staph or strep germs. It is more common in children than adults, and is contagious. 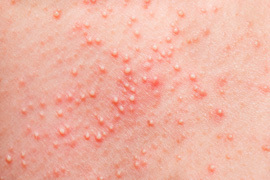 The rash may appear as small blisters or scabs, with swollen glands nearby. Impetigo is not serious, and may go away on its own. If not, prescription antibiotic ointment or oral antibiotics will be prescribed. Viral infections such as herpes, shingles, or chicken pox, are contagious conditions that may produce a rash, generally characterized by red, itchy bumps all over the body. Patients with vial rashes will usually have other viral symptoms such as nausea, sneezing, and coughing. These infections usually last a few days to a week and go away on their own. Treatment is generally not necessary, but may include cream for itch relief. Final infections affect the skin and often cause rashes. For more information, see the section of the website "Medical Conditions" and click the "Fungus" link. Other types of skin conditions such as acne, hives, eczema, rosacea and psoriasis, may also cause rashes. See the section of the website "Medical Conditions" for more information about these diseases.